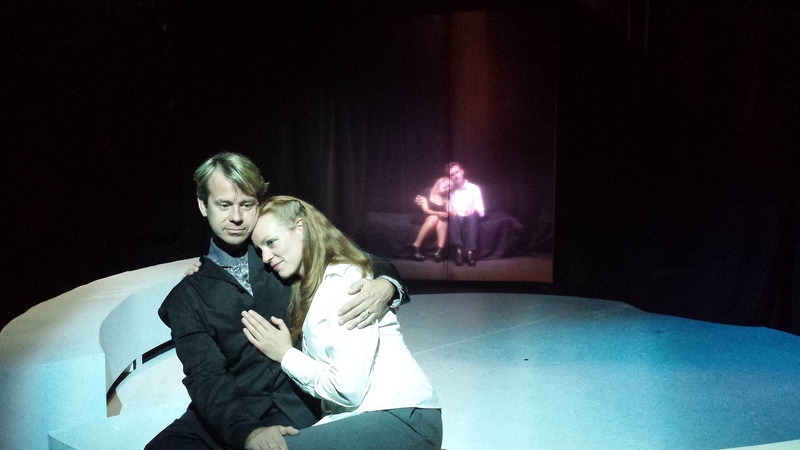 Following the world premiere of Memory Fragments last week, playwright Sam Wallin described the mystery as an example of “cyberpunk.” He explained that this is a form of science fiction that mixes a futuristic setting with elements of film noir. Well, it’s definitely science fiction, and it’s definitely set in the future. The film-noir part isn’t quite so obvious. The scene breaks are accompanied by the kind of jazzy noodlings that would have made Sam Spade feel right at home, but the scenes themselves fail to capture the dark moodiness that characterized Spade’s world. No matter. Memory Fragments may not be noir-ish, but it’s never boorish. As long as you don’t mind being confused for much of the running time, it’s an intriguing murder mystery. The hero is a police detective named Cloud (Stephen Woosley) who’s assigned to investigate the death of a barista named Mordecai (Travis Horseman). Cloud’s first job is to determine whether the man was murdered or committed suicide. In this version of the near future, people’s memories are recorded and stored so that they can be played back as needed. Ordinarily, this makes Cloud’s job pretty easy. In Mordecai’s case, however, the fatal wound destroyed all but 17 fragments of the victim’s memory. Along with Jerome (Andy Woodmansee), an annoying stranger who inserts himself into the investigation, Cloud begins watching the fragments in hopes of solving the case. It’s through the recorded memories that we meet a number of people who played a role in Mordecai’s final days, including a new girlfriend (Colleen Dunne), a male psychiatrist (Andy Batt), a lascivious female psychiatrist (Laura Spires) and a mysterious man in a brown suit (Erik Sternberger). Cloud attempts to sift through the clues with help from his late wife, Meryl (Katharine Pilcher), whom he frequently resurrects in the virtual world where he spends most of his time. Eventually, the mystery of Mordecai’s death is solved, but not until more people have died—and not until Cloud has followed the evidence to the upper echelons of the two huge corporations that control this future society. Speaking after Thursday’s preview performance, Wallin and director Batt revealed that MadLab spent two years planning the play’s premiere. Part of the delay was due to the problem of portraying the work’s frequent shifts between the present and the past, and between physical reality and virtual reality. With help from designers Brenda Michna (scenery and lighting) and Peter Graybeal (sound), Batt’s production succeeds admirably. Especially effective are the gauzy curtains that separate the present from the past, as represented by the recorded memories. Also admirable is the large cast, which also includes Julie Ferreri and MaryBeth Griffith. The portrayals are rooted in emotional reality, which helps to ground a play that otherwise could disintegrate into a confusing mixture of sci-fi jargon and dystopian paranoia. To be sure, Memory Fragments still challenges viewers to keep up, but MadLab keeps them so entertained that they’re happy to make the effort. Memory Fragments will be presented at 8 p.m. Friday-Saturday through Nov. 1 at MadLab Theatre and Gallery, 227 N. Third St. Running time: 2 hours (including intermission). Tickets are $12, $10 for students/seniors, $8 for members. 614-221-5418 or madlab.net.